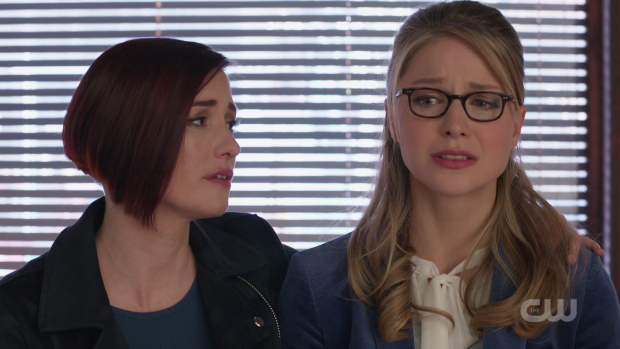 Supergirl returns from hiatus to explore Kara’s recent dismissal from the DEO and the impact this has on the show as a whole. Kara separating from the DEO is a massive shift for this show as she has been working with that organisation since the beginning. It offered her considerable resources and acts as something of a narrative shorthand in terms of moving the plot along. Now that she no longer has that resource work has to be done to establish what the new status quo looks like. At first it isn’t all that different because Alex is still the Director so is in a position to feed her information on the sly so the only major difference is that Colonel Haley will make it difficult for Alex to get that information to Kara. On the surface it doesn’t sound like a massive shift but this episode is all about exploring the difficulties this causes. Colonel Haley has turned her attention to learning Supergirl’s secret identity because that will give her the necessary leverage to control her. I remain baffled that she doesn’t already know this because no effort has previously been made to establish that this has been kept secret from the DEO before. For the purposes of this plot that is meant to be the case but are we supposed to forget about all the loud personal conversations Alex and Kara had within the DEO or the times that Kara was in the building wearing civilian clothes working on articles for CatCo. Maybe the agents are just profoundly unobservant. There are definitely a small number of agents who know the truth and they are Colonel Haley’s target. She sees Supergirl as not being that smart which isn’t entirely unfair as assumptions go so it’s clear it won’t take her long to learn the truth. Fortunately Brainy has the ability to compartmentalise knowledge so that he can’t reveal it but the Human agents aren’t so lucky and are very vulnerable to interrogation. A quick moment where Brainy is noticeably flustered by his conversation with Haley is supposed to establish how formidable she is when extracting information but it falls flat because there is no actual evidence of that within the episode. We see the aftermath of an interrogation but never actually see one which robs the episode of a great deal of tension and urgency. It feels like the writers weren’t sure what story to tell here as everything is noticeably half baked. Brainy’s statement about enduring some unknown alien’s apparently legendary interrogation technique before pointing out that Haley’s is much worse is pretty meaningless as there is no context for either of them. Perhaps the writers don’t have the skill to craft an interrogation that lives up to the hype generated by the characters who have to endure them. If that’s the case then they haven’t exactly got around the problem in a way that works. Eventually Haley does break one of the agents and finds out that Kara and Supergirl are one in the same. This is used to blackmail her into working with the DEO to protect her family. 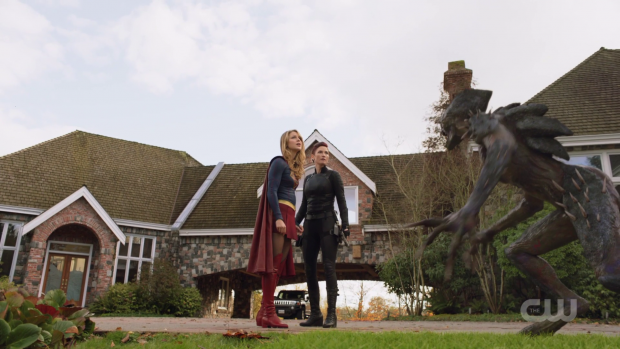 This moment works really well because it’s one of Kara’s greatest fears coming true right before her eyes. Melissa Benoist’s almost shell-shocked expression as Kara had no idea what she would do next was great and added tangible stakes to the situation. Putting aside all of the questions around who does and doesn’t know her identity this had weight to it. Alex knocking Haley out and having J’Onn erase her memory of what she just learned was unexpected and thankfully didn’t make for a simple fix or a cheap reset button. All it did was delay the inevitable as erasing Haley’s memory doesn’t dissuade her from wanting to know the truth. It’s unclear why she brings out the alien that forces people to speak the truth at this late stage as it seems that this would have been the best plan early on. Things like this are used to raise the stakes in a cheap way by giving a character access to a resource they reasonably always should have had. The only way to get around this new element is to have J’Onn erase knowledge of Kara’s identity from everyone at the DEO which includes Alex. I found this really interesting as it makes for a significant loss for both Kara and Alex. It’s unclear what the extent of the loss of knowledge is for Alex as knowing that Kara and Supergirl are one in the same is such a significant part of her life. Has J’Onn simply removed knowledge that Kara is Supergirl from her mind or has he removed everything about her meaning that Alex doesn’t know that she has a sister? 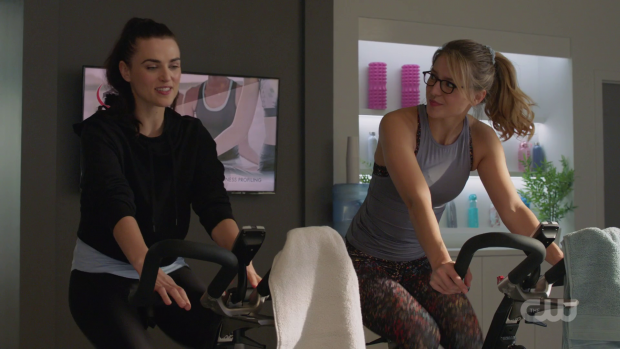 If she simply can’t connect Kara and Supergirl then this presents a number of opportunities such as having Alex not approve of Supergirl’s methods because she doesn’t have that emotional connection to her. I suspect this will be the focus of the following episode and I look forward to seeing how the show plays with it until the inevitable reversal. Some of Alex’s actions were fairly out of character. She talks about not sharing Haley’s values and finding it nearly impossible to work with her to the point that she wants to leave. Kara has to talk some sense into her and point out that her morality is needed at the DEO otherwise Haley will compromise it entirely. Alex practically breaking down isn’t in keeping with who she is as a person. If this had been retooled as needing to call Kara to vent her frustrations then it would have been a much better character beat for her. The episode’s other main plot focuses on attacks by an alien species named the Morai. They have the ability to cloak which makes them perfect assassins. The background of this plot has a lot of potential that is never explored. I really like the idea of aliens being exploited from a young age to serve the government and then being disposed of once they are no longer useful. It’s a story that has morality at its core and shows how casual the anti-alien sentiment is. The military were fine with exploiting the Morai because they don’t see aliens as being Human. Alien sentience is considered inferior to Human sentience as far as they’re concerned so doing whatever they need to do in order to use them as tools of assassination is entirely justifiable. Unfortunately the episode does nothing with this. Of course people being killed whether they arguably deserve it or not isn’t something that Kara can allow to happen but beyond some objections from Alex to Haley about the treatment of the Morai in the past the morality doesn’t really factor in. Kara’s values mean that she should have tried to find a way to stop them without having the DEO wipe them out. She does offer one of them the chance to come back to the DEO and talk but the prospect of willingly submitting to what could be more enslavement causes it to kill itself. Another survives but is thrown in a cell which is established as being a fate worse than death so Kara’s handling of this situation really wasn’t ideal. The situation demanded a more nuanced approach that this episode just wasn’t willing to put the time into. Another issue is that Haley is completely in on this plan and was involved earlier in her career. It’s far from a case of hiding behind following orders as she clearly sees aliens as being less important than Humans based on what she has said which shifts gears for her character from morally murky to unquestionable villainy. It’s a pity that this is the route being taken as she made for an excellent antagonist when it was more difficult to figure out what her values actually were. 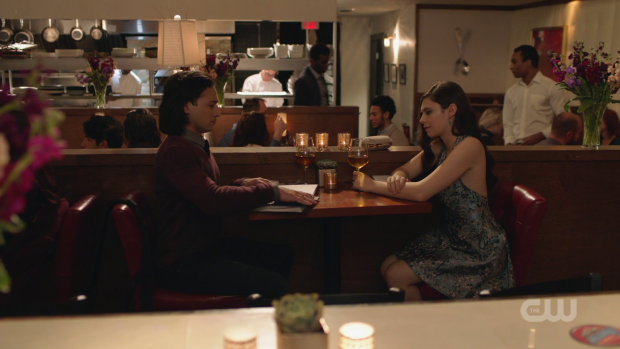 There is further development of Nia’s powers manifesting when Brainy asks her out on what Nia thinks is a date but turns out to be a meeting. He’s looking to encourage her to take an active role in helping Supergirl by using her powers and has sketched out a range of costume ideas that she can look over. This is basically the opposite of what Nia wants in her life at this point as she saw her recent adventure as being a one time thing. She is also clearly disappointed when she learns that Brainy didn’t ask her out on a date which was a nice subversion of the standard build up to a romantic relationship. Brainy is unique and odd enough to bring something that feels new to this overly familiar story. J’Onn has fully committed to his budding role as a detective with a really cool looking office and eagerness to take on cases. This feels like a good fit for the character as he can now help people at a more domestic level which would allow different perspectives to be filtered through him. The James/Lena relationship is becoming less engaging the more time passes. They’ve been avoiding each other since James found out what she did to clear up the situation with the DA but they reach an understanding here and Lena admits to James that she has been experimenting with giving Human beings super powers and he appears to accept it, at least on the surface. It’s very likely that he doesn’t actually approve of this and is keeping it to himself to avoid any more arguments. The worst thing about this plot thread is that James will more than likely end up with powers before long. An uneven episode that has some really good ideas but doesn’t give enough time or thought for them to be explored properly. Haley’s search for Kara’s identity is in theory a huge problem as long as you ignore the fact that the show made it appear as if it were common knowledge within the DEO. Interrogating characters to learn the truth should have been more of a threat than it was but fails to be because no interrogations were actually shown so there was no sense of how good she was at them. Brainy appearing shaken after his doesn’t count because he references other difficult interrogation techniques that he has experienced that the audience has never seen. It’s clumsy and kills the threat level completely. Haley learning the truth and having her memory erased was a genuinely tense moment because of Melissa Benoist’s performance and the consequences that came of it. Alex having her memory of Kara’s Supergirl identity taken from her has so much storytelling potential. She could end up being frustrated by Supergirl’s actions because she no longer has that emotional connection to her or she could be missing significant chunks of her life depending what memories were actually taken. The Morai being enslaved as assassins because of their cloaking ability was a wasted opportunity as the ethical implications of this were never explored. Kara’s approach to dealing with it was less than ideal as she should have found a solution that took the Morai into account rather than resulting in all but one of them ending up dead with the survivor being back in a cage which was established as a fate worse than death for them. 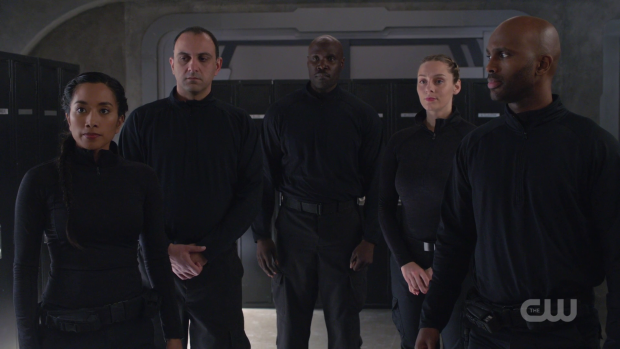 Having Kara be at odds with the military over their views on alien sentience being less important than Human sentience was a great debate that would have been worth having but instead the episode does almost nothing with it beyond some superficial references. Another problem is that Haley shares the belief that Human life is more important than alien life which makes her more villainous than morally murky. The development of the Nia and Brainy relationship worked really well thanks to Brainy’s uniqueness because of his quirky outlook on the world. Nia is disappointed because she thinks he’s asking her out on a date when it’s just a meeting as far as he’s concerned and he’s pushing her into the life of a superhero which appears to be the opposite of what she wants at this point. Brainy’s approach makes for an interesting subversion of the standard romance plot. J’Onn setting up his office for his new role as detective is a great direction for him and the office looks great. Lena and James patching up their relationship is less than interesting and is likely setting up James gaining powers in the near future.